I happened to be in San Francisco during the exhibition "Five Themes" at SF MOMA, and it was the first time I had seen a large show of William Kentridge's work. It took over a whole floor of the museum, with rooms devoted to many simultaneous short films projected onto all four walls, with accompanying voices, or large moving images combining film and animation with music. Other rooms had smaller pieces, combining circular drawings with cylindrical mirrors, forcing the viewer to walk around the picture, or otherwise breaking up the normal viewing experience. His drawing style is rough, and often it isn't clear what the references in his works are to. Knowing that he is from South Africa, it is easy to spot a political dimension to his work, especially when it seems to depict oppression, protest, or political leaders. Even with only a minimal understanding of the context and background of the art, however, it is striking work. The unconventional format of much of the art, its inclusion of Kentridge himself as one of his main subjects of depiction, his use of silhouettes, themes of oppression, bleakness and the strong sense of absurdity that accompanies much of his work -- these all combine to make a very distinctive set of works that one can view for hours. They are rarely moving in a personal way, although sometimes the depiction of oppressed people is directly emotionally powerful. Their appeal comes more from the sense of discomfort and perturbation they cause, combined with real pleasure from the way the artwork is constructed. I left the exhibit knowing that very few artists working today can match Kentridge for the breadth of his vision and the creativity of his art. There is no way that a book can duplicate the experience of seeing Kentridge's work in a gallery, even with the inclusion of an excellent DVD with several of his animations. This book which serves as a companion to the SFMOMA show does not try to recreate the exhibition. 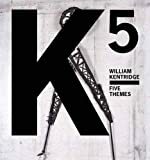 Rather, it gives a background to Kentridge's works and provides several discussions helping to explain what he is doing. The essays are long and require some persistence to read and understand. They provide both history and context, which is valuable. For example, Rudolf Freiling gives an extensive discussion of technology and agency in Kentridge's film work. These essays are best suited to those who are familiar with contemporary art and discussion of it. Most readers will probably be content to browse through the text and focus on the images. An interview of Kentridge by Michael Auping is more accessible. There's a broad range of different works here, and while the essays and interview are interesting, it is the art itself that really holds the attention. The images are not polished, but as one spends time with them, especially in a room full of animated images, they are compelling. One gets a strong sense that he has a highly distinctive vision and that as a body of work, it is both rich and invigorating. Yet it is elusive and defies any simple explanation, and this too is part of its appeal. SF MOMA Press Release for Five Themes.